When just your average full-size truck won’t due, it is time to check out the super-sized 2018 Ford Super Duty F-450 DRW XLT for Sale in Hawthorne, CA. Ready-built for the toughest tasks, this large and in charge work truck offers ultra luxury, a class-leading max-tow rating of 32,500 pounds and more maneuverability than most in its class. Let’s take a closer look at the heaviest of heavy-duty work trucks. The only 1.5-ton truck that's available as a regular pickup for consumers is available in a myriad of trim levels, including the XL, XLT, Lariat, King Ranch, Platinum, and Limited. Each trim level is available with a crew-cab body, an 8.2-foot bed, a dual rear-wheel axle and a powerful 6.7-liter diesel V8 engine, which is partnered with a six-speed automatic transmission that offers an impressive 450 HP and 935 lb.-ft. of torque. The base model comes standard with 19.5-inch commercial tires that are mounted on polished alloy wheels. This back to the basics model also offers large front tow hooks, manually telescoping towing mirrors, a removable locking tailgate with tailgate lift assist, a three-inch trailer hitch receiver (with 2- and 2.5-inch inserts) and large running boards. Despite being the low man on the totem pole, the XL model offers inside niceties like air conditioning, vinyl upholstery, a 40/20/40-split front seat, a 60/40-split rear seat, vinyl floor covering, a dual glovebox and overhead console with storage bins, a driver information display, rearview camera and a six-speaker audio system. Stepping up to the XLT model gives this powerful truck a chrome grille and bumpers, power-adjustable and heated mirrors that telescope manually, keyless entry, cloth upholstery and carpeting, rear under seat lockable storage, power windows and locks, rear privacy glass, cruise control, a rearview camera, the Sync voice-controlled infotainment system, a 4.2-inch display, a USB charging port, a CD player and satellite radio. Springing for the midrange Ford Super Duty F-450 Lariat trim level continues to add to the amenities like rear parking sensors, dual-zone automatic climate control, leather upholstery, power-adjustable front seats with a center console, power-adjustable pedals, a rear-seat center armrest, an auto-dimming rearview mirror, an 8-inch center touchscreen, the upgraded Sync 3 voice-controlled infotainment system, two 110-volt household-style power outlets, and a premium Sony 10-speaker audio system with two additional USB ports. If you are a cowboy at heart, you just might want to opt for the Western-themed King Ranch model. This manly man’s truck offers a body-colored grille with accent-color bumpers and lower body trim, LED box lighting, unique fender badges, keyless ignition and entry, remote start, upgraded leather upholstery, heated and ventilated front seats, driver-seat memory settings, an easy entry-and-exit driver's seat, heated steering, and a navigation system. Platinum models add adaptive steering, LED headlights and fog lights, a remote tailgate release with a built-in step, a blind spot monitoring system with rear cross traffic alert, multicontour front seats with massage, and a leather- and wood-trimmed heated steering wheel. Don’t let the name fool you, the Ford Super Duty F-450 Limited is the cream of the crop. 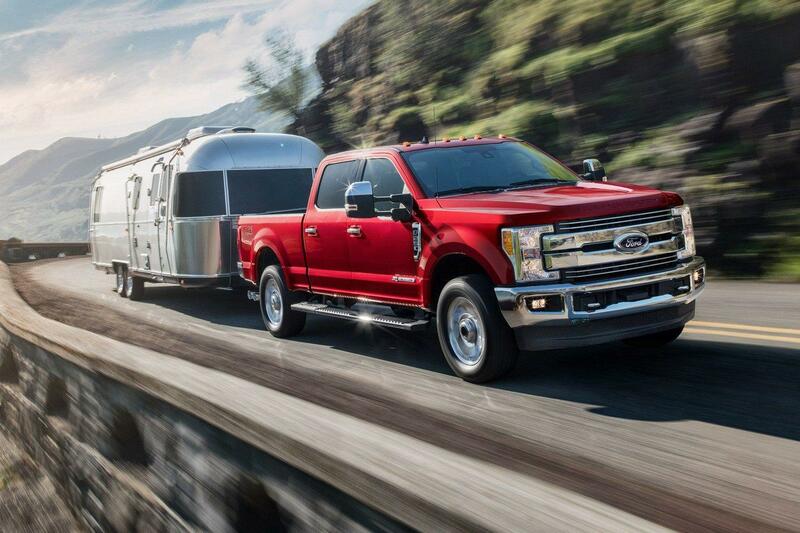 The only F-450 to offer four-wheel-drive also offers a surround-view and trailer-towing camera system, adaptive cruise control, lane departure warning, a panoramic sunroof, and a Limited-exclusive two-tone leather interior. 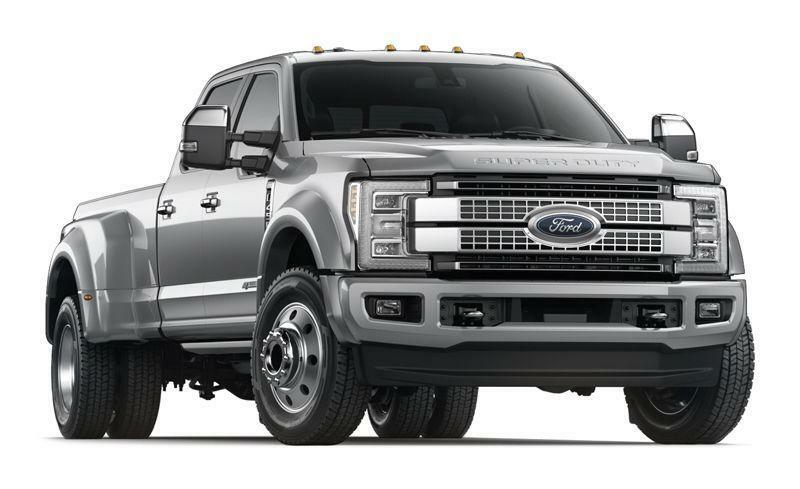 Are you ready check out the heaviest of heavy-duty pickups? Get to South Bay Ford today to find the work truck of your dreams.